The Articles of Faith: A Series of Lectures on the Principal Doctrines of the Church of Jesus Christ of Latter-day Saints is an 1899 book by James E. Talmage about doctrines of The Church of Jesus Christ of Latter-day Saints. The name of the book is taken from the LDS Church's "Articles of Faith", an 1842 creed written by Joseph Smith. Smith's "Articles of Faith" became part of the LDS Church's scriptural canon in 1880 as part of the Pearl of Great Price. In 1891, when the First Presidency of the LDS Church asked Talmage to produce a work of theology that could be used in church schools, Talmage decided to use Smith's Articles of Faith as an outline of his work. He first delivered the material that he would organize into a book, in a series of lectures in 1893 at Latter-day Saints' University in Salt Lake City, Utah, which Talmage was the president of at the time. First published in 1899, Talmage's work is composed of 24 chapters. The first edition was published by the LDS Church, and has gone through over 50 English-language editions. It has also been translated and published in 13 other languages. The book continues to be published today by Deseret Book, a publishing company owned by the church. In the below are quoted certain parts of the Articles of Faith that show the LDS Church's thinking behind their former plan, to get the Lost Tribes of Israel together, by assembling certain North American Indian tribes all in one place, as part of the goal of establishing Zion. 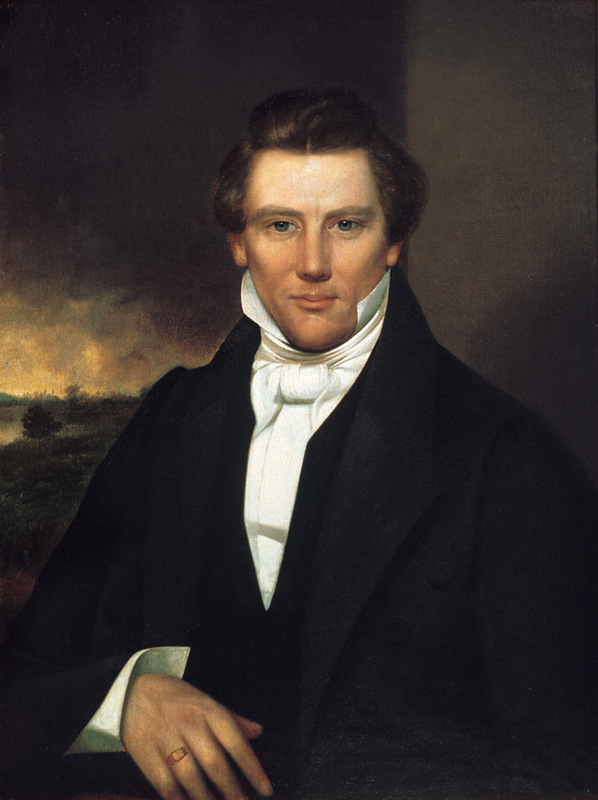 (As we will see later in this analysis, the current plan, established by certain high-ranking Mormons working with other parties, is to build Zion at a different location than that indicated in the Articles). BY DR. JAMES E. TALMAGE; WRITTEN BY APPOINTMENT; AND PUBLISHED BY THE CHURCH. The Deseret News, Salt Lake City, Utah, 1899. LECTURES ON THE ARTICLES OF FAITH OF THE CHURCH OF JESUS CHRIST OF LATTER-DAY SAINTS. LECTURE V. FAITH AND REPENTANCE. Article 8.— * * * We also believe the Book of Mormon to be the word of God. V. CORROBORATIVE EVIDENCE FURNISHED BY MODERN DISCOVERIES. 7. Survival of the Hebrew Language among American Tribes.—"It is claimed that such survivals are numerous in the religious songs and ceremonies of many of the tribes. A number of writers who visited or resided among the tribes of the northern continent, assert that the words Yehovah, Yah, Ale, and Hallelujah, could be distinctly heard in these exercises. Laet and Escarbotus assure us that they often heard the South American Indians repeat the sacred word Hallelujah. "— Elder George Reynolds, The Language of the Book of Mormon. LECTURE XVII. THE DISPERSION OF ISRAEL. Article 10.— We believe in the literal gathering of Israel, and in the restoration of the Ten Tribes, etc. 20. The Lost Tribes.— As already stated, in the division of the Israelites after the death of Solomon, ten tribes established themselves as an independent kingdom. This, the kingdom of Israel, was terminated, as far as history is concerned, by the Assyrian captivity, 721 B. C. The people were led into Assyria; and later disappeared so completely that they have been called the Lost Tribes. They seem to have departed from Assyria, and while we lack definite information as to their final destination and present location, there is abundant evidence that their journey was toward the north. The Lord's Word through Jeremiah promises that the people shall be brought back "from the land of the north," and a similar declaration has been made through Divine revelation during the present dispensation. LECTURE XVIII. THE GATHERING OF ISRAEL. 1. The Gathering Predicted.— Terrible as was the chastisement decreed on Israel for their waywardness and sin, amounting, as it did, to their dissolution as a nation, and to a virtual expulsion from the sight of the Lord's favor; fearful as has been their denunciation by Him who delighted to call them His people; through all their sufferings and deprivations, while wandering as outcasts among alien nations who have never ceased to treat them with contumely and insult, when their very name has been made a hiss and a byword in the earth;— they have ever been sustained by the sure word of Divine promise, that a day of glorious deliverance and blessed restoration awaits them. NOTES. 1. Gathering Now in Progress.— The Latter-day Saints "are building up stakes of Zion in the Rocky Mountain valleys, and in this way are fulfilling predictions of the ancient prophets. Isaiah hath it written, 'And it shall come to pass in the last days, that the mountain of the Lord's house shall be established in the top of the mountains, and shall be exalted above the hills; and all nations shall flow unto it. And many people shall go and say, Come ye, and let us go up to the mountain of the Lord, to the house of the God of Jacob; and he will teach us of his ways, and we will walk in his paths; for out of Zion shall go forth the law, and the word of the Lord from Jerusalem' (Isaiah ii, 2-3). It is remarkable how minutely the Latter-day Saints are fulfilling the terms of this prophecy: 1. They are building the temples of God in the tops of the mountains, so that the house of the Lord is truly where Isaiah saw it would be. 2. The Saints engaged in this work are people gathered from nearly all the nations under heaven, so that all nations are flowing unto the house of the Lord in the top of the mountains. 3. The people who receive the gospel in foreign lands joyfully say to their relatives and friends: Come ye, and let us go up to the house of the Lord, and he will teach us of his ways and we will walk in his paths. "— Roberts' Outlines of Ecclesiastical History, p. 409. Article 10.— We believe * * * That Zion will be built upon this [the American] continent, etc. (material inside square brackets in original). 16. Later revelations called the elders of the Church to assemble in western Missouri, and designated that place as the land appointed and consecrated for the gathering of the Saints. "Wherefore this is the land of promise, and the place for the city of Zion." The town of Independence was named as "the center place," and the site for the temple was designated, the Saints being counseled to purchase land there, "that they may obtain it for an everlasting inheritance." On August 3rd, 1831, the temple site thus named was solemnly dedicated by the prophet, Joseph Smith, and his associates in the priesthood. The region round about was also dedicated, that it might be a gathering place for the people of God. 17. Such, then, is the belief of the Latter-day Saints; such are the teachings of the Church. But the plan of building up Zion has not yet been consummated. The Saints were not permitted to enter into immediate possession of the land, which was promised them as an everlasting inheritance. Even as years elapsed between the time of the Lord's promise to Israel of old that Canaan should be their inheritance, and the time of their entering into possession thereof,— years devoted to the people's toilsome and sorrowful preparation for the fulfillment,— so in these latter-days, the Divine purpose is held in abeyance, while the people are being sanctified for the great gift, and for the greater responsibilities associated with it. In the meantime, the honest in heart are gathering to the valleys of the Rocky Mountains; and here, in the tops of the mountains, exalted above the hills, temples have been erected, and all nations are flowing unto this region. But Zion shall yet be established on the chosen site; she "shall not be moved out of her place," and the pure in heart shall surely return, "with songs of everlasting joy to build up the waste places of Zion." 18. But gathered Israel cannot be confined to the "center place," nor to the region immediately adjacent; other places have been and will be appointed, and these are called Stakes of Zion. Many stakes have been established in the regions inhabited by the Latter-day Saints, and these are to be permanent possessions; and thence will go those who are appointed from among the worthy to receive possession of their inheritances. Zion is to be chastened, but only for a little season, then will come the time of her redemption. As stated in part 1 of this analysis, the action in part of Michener's Centennial is a partial 'microcosm' for what he believed the Mormons are currently doing, in order to establish Zion. This will be discussed as the analysis proceeds. a. Wikipedia, 'Articles of Faith (Talmage)'. Web, n.d. URL = http://en.wikipedia.org/wiki/Articles_of_Faith_(Talmage). b. James E. Talmage. The Articles of Faith, first edition (1899). Google archived public domain book. pp. 2, 98, 110, 281, 291, 296, 300, 304, 307, 326, 338, 341, 355, 356, 363-365. URL = https://archive.org/stream/articlesfaithas00talmgoog#page/n0/mode/2up.